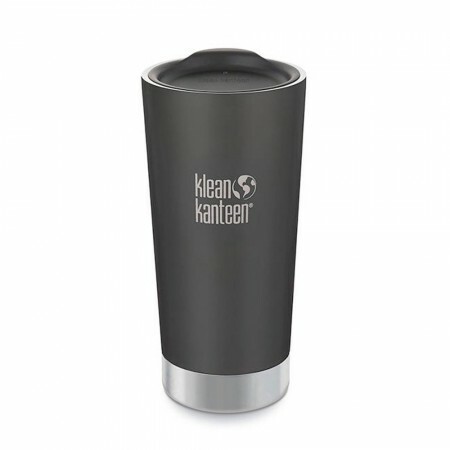 An extra large insulated tumbler for hot and cold drinks on the go. Made from double walled, food grade stainless steel, this reusable cup will keep drinks hot for 6 hours and cold for 24 hours and won't leach toxins or impart flavours. Enjoy your coffee and then a smoothie with just a quick rinse. Shale black colour. 592ml. Double-wall construction insulates both cold and hot beverages. 6hrs hot and 24hrs cold. Fitted with screw-top loop cap made from BPA free polypropylene. Requires only a rinse in between uses, so it can be used for coffee and then beer, smoothie or juice without imparting flavours. Comes with a basic sipping lid - NOT sealable, leak proof or spill proof. 18cm H x 9cm D (at widest). 18/8 food grade stainless steel, BPA free polypropylene (recycle #5).